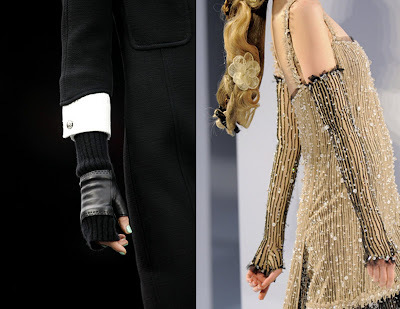 I'm so loving the fingerless gloves! It's so 80s! Still looking for the perfect leather glove. Most of the ones I've adored so far are so expensive (for a glove that is). And this time I'm thinking twice before getting somethings that is overpriced (because I'm just the worse big spender out there) especially since its a fall trend and may be over just as fast as it had begun. Karl Lagerfeld is always seen wearing them. Ok, so he's a man, but I still want to steal them from him. 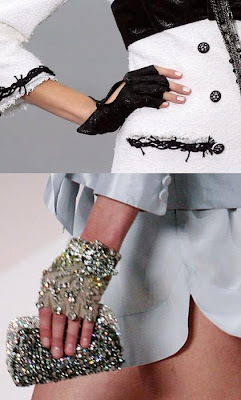 In his Chanel couture and the ready to wear fall 09 fashion shows feature gloves to a maximum!